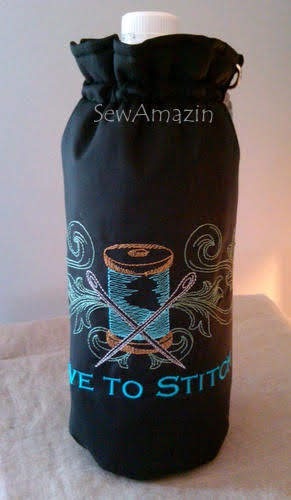 In April I made a few of my insulated bottle carriers embroidered with sewing and craft designs. Each one is stitched on lightweight black sport nylon with white rip-stop nylon for lining and nickel-plate swivel hooks and d-rings for the adjustable shoulder straps. This Love to Stitch design is from Embroidery Library's All You Need is Love design pack. The design is a lightly filled spool of thread with a pair of silver needles crossed in front and elegant swirls as a background. I stitched it in shades of blue with green swirls. This bottle carrier has a black shoulder strap. This Love to Quilt design is from the same embroidery design pack. I used metallic gold for the background swirls with blue, teal, and green for the lightly filled quilt block. The hot pink letters match the hot pink shoulder strap. 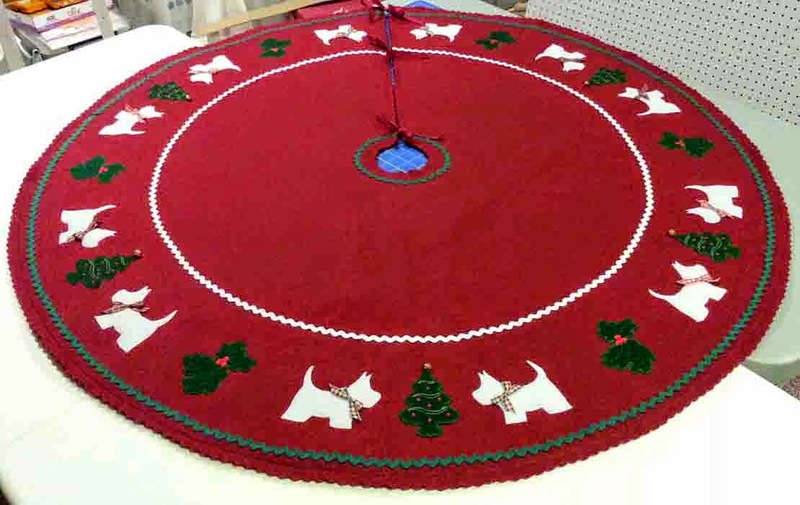 Other designs included in the pack are Love to Knit, Crochet, Scrapbook, Stamp, Sew and Craft. Each design features a lightly filled iconic design for the craft and similar feathery background swirls. 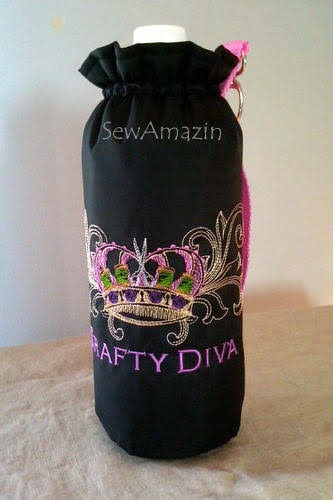 This Crafty Diva design is similar in style to the other two, but is not part of the design pack. The golden crown has green thread spools and purple buttons in place of emerald and amethyst jewels and a pair silver scissors as the centerpiece. The bright pink text matches the pink shoulder strap. 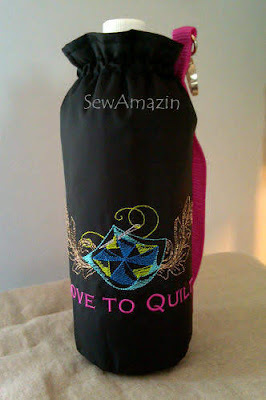 I was inspired to make these bottle carriers because the street fair where I was supposed to have space with The Cozy Quilt Shoppe coincided with the last day of the quilting NJ Shop Hop. 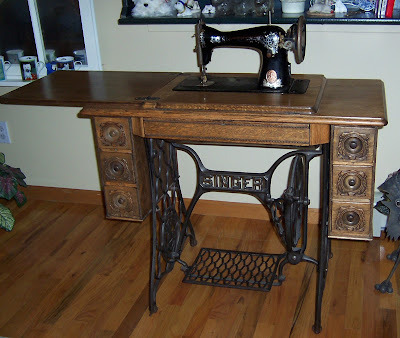 Expecting lots of sewing enthusiasts to visit CQS that day, I wanted to be prepared - but the fair was rained out! So I left them at CQS with some of my other handmade items... and one of the bottle carriers was sold shortly thereafter. I believe the other two are still available through CQS. I don't have any plans to add these bottle carrier designs to my Etsy or ArtFire shops, but any of the sewing and crafty designs from the collection can be requested as a custom order. One of the quilting ladies suggested stitching the Crafty Diva design on a black t-shirt, which I did (but forgot to photograph it), and one of our volunteers is test-wearing it for a while. In my previous post I shared that I had recorded a segment as part of the premier episode of a friend's podcast - the first episode has been delayed and it looks like we will need to re-record my segment in July. I will share the link to the podcast if/when it eventually is 'live'.